I “had” to “work” today. Poor me. Ha ha. 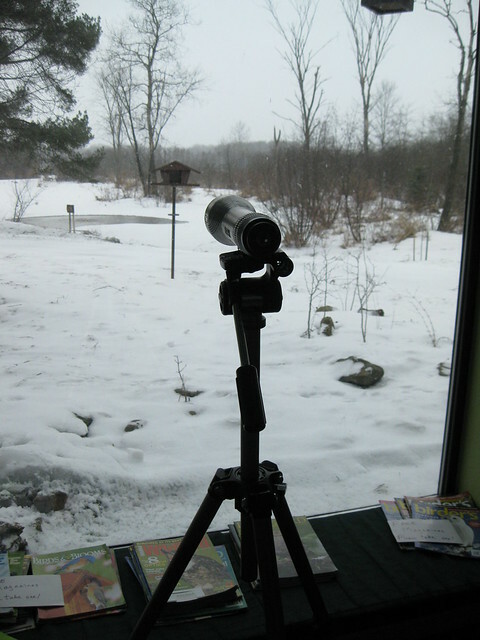 What could be better than sitting at the back windows at Audubon, watching and counting birds with Linda O’Brien? Or to have visitors like Dave and Anita Cooney drop by? 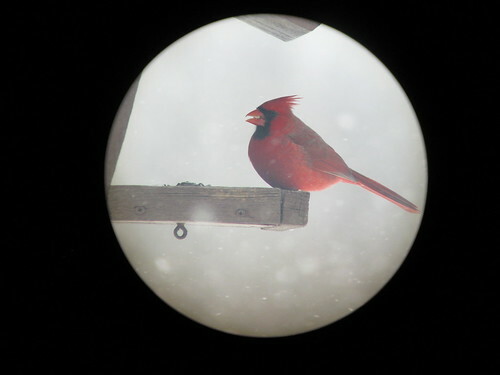 And the occasional family who wants to build a birdfeeder? 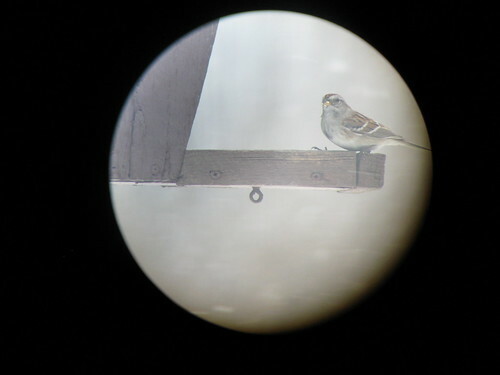 I set up the spotting scope and snapped a few shots of birds at the feeder using my little Canon Powershot. Linda just taught me today the difference between the male and female: the female’s head is not red all the way to the beak. There is a section that is sort of grayish. So far we have had 14 species and nearly 80 individuals. 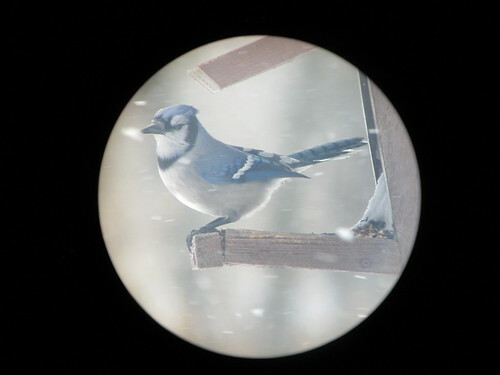 We will be reporting our list to http://www.birdsource.org/gbbc later today! 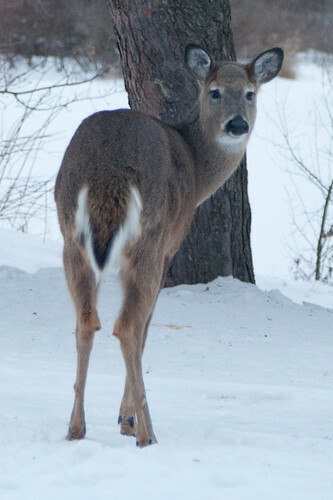 I wrote in December about a White-tailed doe that lives at Audubon, dubbed by one of our volunteers “Gretchen.” I hadn’t seen her in a while and began to worry that she might have succumbed to our rather long and cold winter. 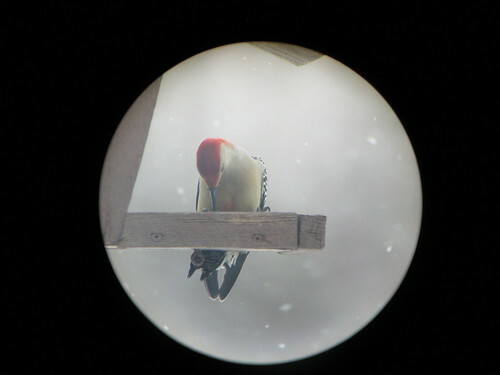 Friday, I had to stay at the Center into the evening, and as I was setting up for a program, I saw her through the back window, cleaning out the bird feeders with her two youngsters. Something strange caught my eye, and despite poor light conditions and fear that I would spook her, I tried to get a photo. The hoof on her atrophied foot seemed long, like an untrimmed fingernail. 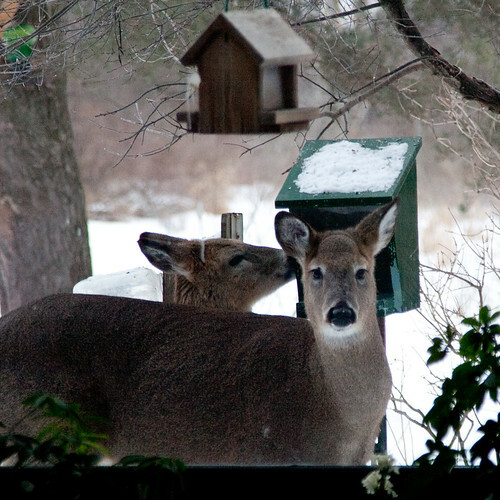 "Gretchen" stares me down while one of her fawns cleans out the feeder behind me. 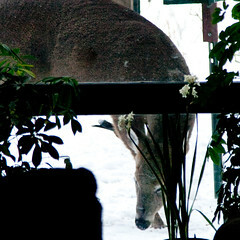 Our “three-legged deer” was at the feeders with two yearlings. (Only one is pictured above.) This seemed strange. Earlier in the spring, we rarely saw her with two and suspected one of her twins had perished. Maybe these two youngsters were not both hers? "Gretchen" gives me one last wary glance before heading back to the brush. It seems to take a very long time to form a good habit, and only an instant to stop it. That just doesn’t seem fair, does it? I had been in the habit of regular walks in the woods with my dog. It felt good to get out every day, regardless of the weather. It was good for her. It was good for me… And then, something happened… I can’t even pinpoint exactly what it was. It took me a while to refit the bindings to my boots. The weather got too hot. The trail got overgrown. My health took a temporary downhill turn. I got lazy. Inertia is a powerful thing. Unfortunately, in my life, I’m the object at rest tending to stay at rest unless acted upon by an outside force. I want to be the object in motion that stays in motion. Oh, I’ve taken the occasional walk. 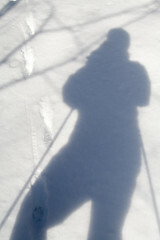 But a couple of winters ago, I went: Every. Single. Day. Regardless of the weather. And it was glorious. I want to experience that gloriousness again. To that end, I have pushed myself lately to get outside more, and to eat better and less. I made a resolution… last Monday was Day One. I did pretty well through this busy week. But not as well as I hope to be doing. Thursday, I had a really lovely walk with Lolli, the wonder dog. 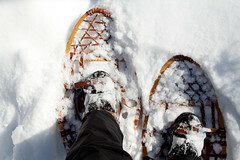 Snow shoes. Bergman park. Back in the woods. It was clear that Lolli had missed these romps in the woods as much as I had. We could not resist leaving the trail to follow the fox tracks. 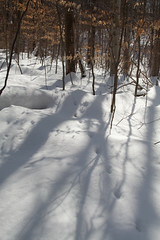 At one point, we left the “trail” to follow some old, snowed-over fox tracks. What an interesting path he took us on. Eventually, it led back to a familiar trail where Trillium, Dwarf Ginseng, and Early Meadow-Rue will bloom in the spring. There is a place along this trail that always makes me stop. I don’t know if it is because I’m too tired to go on, or if there is some magic that holds me there. A deep sense of peace and connection comes over me when I get there, and I just have to stop and breathe deeply. I don’t understand why it is sometimes so hard to get up and go do something that I know will make me feel great. Dang that Inertia.